The perfect indulgence to finish off a meal, or start one, or have all on it’s own! Mix water and sugar in a saucepan and cook to 118 degrees celsius or 244 degrees Fahrenheit. In the mean time whisk egg yolk in an electric blender, then poor the cooked sugar over it while mixing. Whisk until cooled down completely, then add slowly add the butter and whisk until fully incorporated. Place sugar and water in a saucepan and cook to 118 degrees celsius or 244 degrees fahrenheit. Whisk egg white to soft peak in an electric mixer then slowly add the cooked sugar while whisking. Whisk until the meringue has cooled down. Add a punnet of raspberries to the meringue and whisk. Then gently fold the butter cream through the meringue and keep aside. Line a 22cm round springform cake tin with the sponge finger, side and bottom. Place the butter cream mixture inside the lined cake tin and decorate the top with the remaining raspberries and sliced yellow peaches. Today I decided to share with you a different version of a very traditional French dessert called the Tarte Tatin. Traditionally it is done with apples but today I’ve put a modern twist on it or you can say an “Australian twist” by using mangoes instead. Now is the perfect time to use mangoes, they are in full season, ripe and full of flavour. I thought I’d pair the mangoes with thyme, it might sound weird at first, but once you’ve tried this delicious recipe, you’ll understand. I think the thyme balances the sweetness of the mango and the caramel, it adds freshness to this wonderful dessert. Preheat your oven at 180 °C . Put the sugar in saucepan and add just enough water to dissolve it. Cook the sugar until you have a golden brown caramel, then pour it into a round tart dish and leave it cool down. In the meantime peel the mangoes, slice the cheeks off and cut them into wedges. Place the mango wedges on top of the caramel in a circular pattern, creating 2 layers. Sprinkle the roughly chopped thyme on top of the mango and cover the dish with the puff pastry. Bake in the hot oven for 20-25 minutes or until the pastry is golden brown. Leave the Tarte Tatin cool down a little bit, then carefully place a round serving tray upside down on top of the tart, place one hand on top and one at the bottom and quickly flip it around. One of the reasons why I love summer is because of all the fruits that are available to us, like peaches, nectarines, mangoes, apricots and lychees for example. There are so many different recipes you can create with them, like a delicious fruit salad, a sorbet, tarts, crumbles or ice creams. Stone fruit are packed with flavour and have a very fragrant smell that represents summer to me! 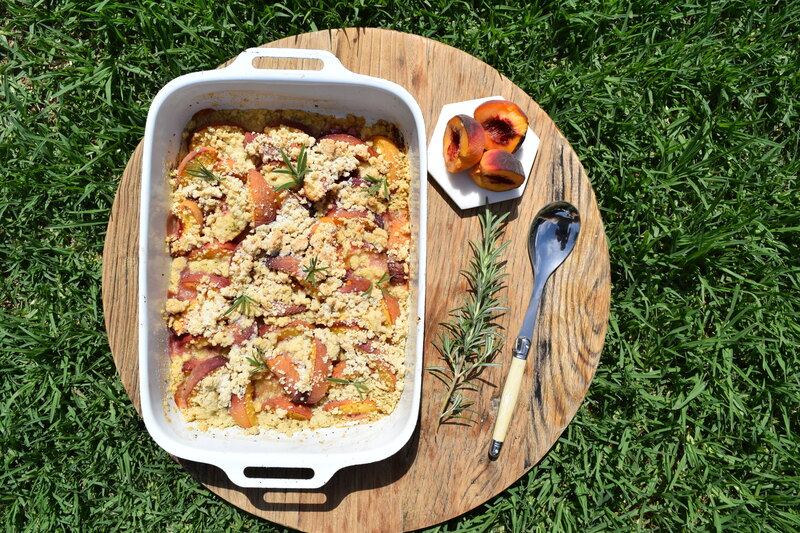 Today I’ve decided to share this delicious yellow peaches and rosemary crumble recipe. 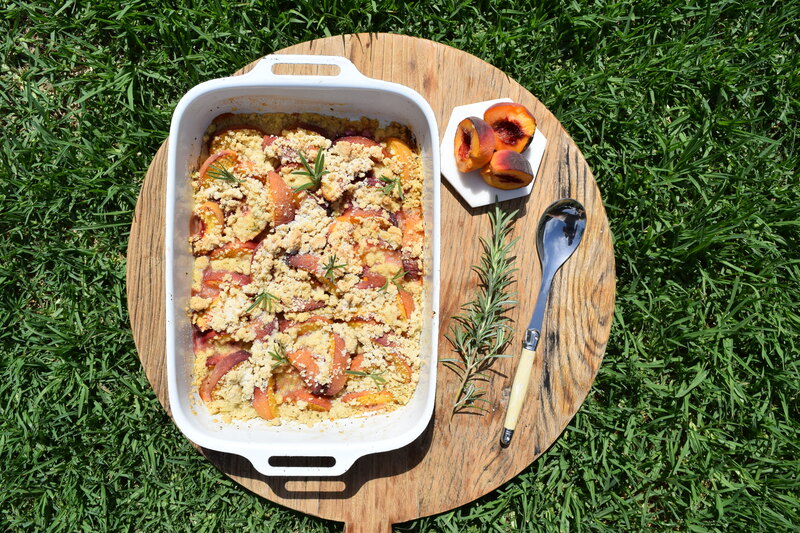 I think the rosemary enhance the flavour of the peaches and add that extra freshness to the crumble, especially when I picked it from my garden 2 minutes before! Preheat oven at 190 °C (375°F). Cut each peaches into 6-8 wedges and place them in a baking dish. Place the oats and flour in a food processor and mix well, then add the butter and mix until it resemble an even crumb mixture. Add the sugar and mix through. Cover the fruit with the crumb mixture and bake for approximately 20 minutes or until the crumble is golden. Honeycomb is a fun and simple Amuse-Bouche that is full of flavour, light and delicious . It is also a great addition to many dessert recipes like waffles, ice cream or sprinkled on top of a berry crumble. Perfect little treat to go with your coffee and tea at the end of you meal or you can also package them to give them as presents to your friend or family!!! Line a deep stainless steel bowl with baking paper. Place the sugar and water into a saucepan and stir to dissolve the sugar. Clean the side of the saucepan with a pastry brush and a little bit of water, to prevent the sugar from crystallising. Bring the sugar to the boil and cook it until it become slightly brown, you only want a pale caramel. Take it of the heat, put the saucepan next to the stainless steel bowl, and pour the baking soda in the caramel while whisking very quickly , Do not whisk for too long, only a few seconds. Once you add the baking soda it will rise very quickly a little like a volcano! Pour the honeycomb in the bowl as soon as you stop whisking and leave to cool down completely. It should become hard pretty quickly. In the meantime, break down the chocolate in a stainless steel bowl and melt it over a bain-marie. Break the honeycomb into big chunks, dip half of them into the chocolate and the flowers. Leave the chocolate cool down so it hardens and they are ready to be served! The Macaron appeared in Europe in the middle ages, made from sugar, almond and egg white from the very beginning. Some say that the Macaron was born in the VIIIe century in venetians monastery. They were introduced in France by Catherine de medicis for her wedding with the Duc d’Orléans. The macaron use to be eaten as individual biscuits and it’s not until 1830 that, in Paris, pastry chefs decide to stick two macaron together using ganache to create the “parisian” macaron which was later popularized by the very famous Ladurée. They are now many different flavours of macaron like a mandarine and olive oil from Pierre hermé in Paris or lime and basil and even peach and rose! I have decided to add a festive touch to my macaron today by using Christmas spices to flavour my crème. Preheat the oven at 160 degrees Celsius and make sure all the ingredients are measured. In a food processor, blitz the icing sugar and almond meal until it is very fine. Make sure it is really fine otherwise the top of the macaron won’t be smooth. Sieve the almond meal and icing sugar to remove the chunky bits, and keep aside. Whisk the egg white to soft peak, then slowly add the sugar and keep whisking until it is all dissolved. Add the food colouring and whisk until combined. Using a spatula, incorporate half of the almond meal and icing sugar, mix, then add the other half. Gently work the mixture by folding it onto itself, making sure you scrape the bottom to get all the ingredients. Work it until it becomes glossy and form a ribbon when you lift the spatula (see video). Using a pipping bag with a nozzle, lay the macaron on flat baking tray lined with greaseproof paper. Leave them on the bench top for about 15 minutes so that a skin forms on the top. Check if they are ready to be baked by gently touching the top with your finger, if it doesn’t stick then they are ready. Bake for 15-20 minutes, then leave them cool down before garnishing them with the crème. Boil the milk with the vanilla ( seeds and pod) and the spices. Whisk the egg and sugar until slightly white and fluffy, add the flour and mix until combined. Pour the hot milk through a sieve, whisk to combined all the ingredients, and cook for about 3-5 minutes while whisking. Pour the crème in large dish, spread it as thin as you can to cool it down quickly. Once cooled completely, place it in an electric blender, whisk until it is smooth and add the soft butter. Keep whisking until the mixture is glossy and smooth. To put the macaron together, simply pipe a little bit of crème in the center of half of the shell and put a shell on top! This recipe comes from Alsace. This region, in north-East of France, is famous for their architecture like the Palais Rohan, but also for their cuisine, which incorporates some Germanic traditions being that the town borders Germany. Their culinary specialties include Cervelas, Tarte flambée, Choucroute (Sauerkraut) and Baeckeoffe, a mutton, beef and pork stew. They have one of the richest cuisines in France and are well know for serving big portions. The recipe I am sharing with you today is called a Kouglof, a cake containing yeast, raisins, rum, & almonds. It has a distinctive shape because of the special mold it is cooked in, and you’ll find variations of this delicious cake in Germany and Austria. Once cooked, the Kouglof is soaked in a delicious vanilla and rum flavoured syrup that makes this dessert even more irresistible. To add a festive twist to this traditional recipe, I have chosen to pair it with a ginger bread crème anglaise. Warm up the milk and dilute the yeast into it. In an electric mixer, like a Kitchen Aid for example and equipped with the hook attachment, place the flour, sugar and salt in the bowl and mix for a couple of minutes. Add the yeast mixture, while mixing on medium speed, add the eggs one at a time and whisk on high speed until the dough detach itself from the sides. Slowly add the soft butter and mix until it is all incorporated, cover with cling film and place the bowl in a warm place until the dough has doubled in size. Preheat the oven at 180 degrees Celsius and line the mold with soft butter and place an almond in each of the small holes of the mold. Mix the dough with the hook attachment on medium speed and add the raisins, mix until well combined. Place the dough in the mold to about ¾ , leave to proof until it has reached the top. Brush the top with an egg yolk and bake for 25-30 minutes depending on your oven. Unmould the Kouglof and soak it, using a pastry brush, with the syrup. Warm up 1 liter of water then add the rum, place the raisins or currants in the liquid for 30 minutes then strain. This process will avoid that the raisins fall at the bottom of the mold while cooking. Bring 500ml of water, orange zest, lemon zest and vanilla to the boil, then turn the heat of and add the rum. Bring the milk and spices to the boil. In a mixing bowl, whisk the yolks and sugar together. Pour the hot milk over the top and whisk until all the ingredients are dissolved. Pour the mix back in the pot and cook on medium heat using a spatula to stir. Once the thin layer of foam at the top disappear, check the cream by lifting the spatula out and drawing a line with your finger, if the line remains it means that the anglaise is ready. Pour the crème anglaise in a clean bowl and refrigerate.